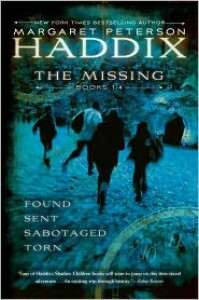 I finished Found today, the first book in The Missing series written by Margaret Peterson Haddix. It was quite a fast read, and one that pulled you in and held your interest the entire way through. It is a science fiction book that is revolving around time traveling, with a unique storyline that is actually pretty creative. The entire book follows three children, a Jonah and Kathrine (brother and sister) and their neighbor, Chip. The three of them together are trying to unravel a big mystery that involves strangers, people and things disappearing before their eyes, intruders, the FBI, and all sorts of things that will have you reading one, waiting to see what comes next. I will say, this book is highly saturated with adoption. I think that some children who are adopted might find this book comforting, in that "someone feels like me" sentiment, while others it could be damaging. Even within the book, Chip discovers he is adopted, which sends him into a downward spiral of an identity crisis, sharing everything he is going through with Jonah. This in turn, causes Jonah, who is also adopted but quite happy with his life, to head down the same path. I am not sure that is the best for all children to read about that are adopted. Also, I thought the writer didn't handle the topic up kidnapping very tastefully. Why it was even interjected into the storyline so many times, is beyond me. It was unnecessary. But there was plenty of times the three kids were running around doing investigative work that was, of course, slightly dangerous to be doing at their age, leaving them to be making light comments about "what if we get kidnapped" type of thing. Every time it was mentioned, I got the feel that it was almost like a joke, like they were saying...O-well, if we get kidnapped! That was kind of disturbing for me, coming from the point of view of a mother who is well aware that an actual real kidnapping is a terrible thing, and a lot of times, life threatening. I found it to be quite insensitive and poor judgment for the author to keep including these comments. Children do not need to be taught that kidnapping is nothing to be serious about. I really didn't like that in the book. There was also a moment in the book where they were trying to explain how a ripple in time is created, by giving the example of if you go back in time and kill your grandmother, the paradox that creates for your existence. Why choose to pick writing about going back to kill your grandmother to explain this? There is probably a ton of other ways the author could have chose to express this idea, or at least word it in a way that wasn't slightly creepy to be thinking of a bunch of kids reading this in a casual manner. I don't think that authors need to lightly introduce, in an insensitive manner, topics such as kidnapping or killing grandmothers. It was a bit strange for me. Aside from those things, the book was pretty good. It was a very creative science fiction book, and I love time traveling tales. I am curious to read on in the series, but I am not sure I will be racing out to the library to gather the next books up anytime soon. Also, I would feel comfortable with my own children reading this book, however, that is because I know they understand the seriousness of these topics, and I know they would probably be thinking the same thoughts I am while reading it. I know not all children are taught about these topics by an adult with the appropriate intent, giving the correct message and information on such serious topics, so I don't think this book is best for all children. I especially loved this quote from the book, as I have always wondered if others felt this exact same way, that many times you associate a book you read with what was going on around you (or what was going on in your life) while you read it. Cornelia Funke describes this feeling so perfectly that it makes me widen my eyes in excitement to find that Meggie from within these pages is just like me. After 12 years of marriage, I can still remember sitting in bed at night reading Great Expectations, with my husband beside me thinking he was besting me by knowing who the benefactor was (however I had guessed correctly). I remember listening to an audio book on My Antonia, hearing about such a fascinating character that kept my mind distracted and unfocused when my daughter was very ill and in the hospital. I believe that Cornelia Funke must be correct, that memories cling to the printed pages of a book. Yesterday we enjoyed a family day that consisted of eating out at Red Lobster and then watching How to Train Your Dragon 2 in the theater. Every time I watch one of those movies, I am always curious to give the books a try. One of these days I will give in! But for today, I am reading through and enjoying the paper dolls in Chinatown Paper Dolls, and reading a bit more in Inkheart. I have the trilogy box set, but have never read any of them (though I've seen the movie). 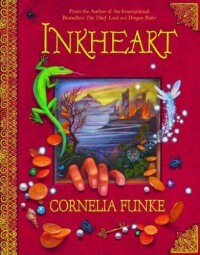 I am curious to see what happens in Inkspell and Inkdeath, but first I want to see if I can read through Inkheart. I absolutely loved this book. It was really well written, and had lots exciting unexpected twists and turns. 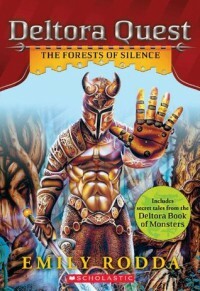 So many things happened that It'll be tough to summarize, but Lief and Barda go to the Forest of Silence and are saved by a messy haired girl named Jasmine, who helps them on their adventures to find The Seven Stones of Deltora. OMG I love this book! Because it includes a map of were each and every Lalaloopy lives! 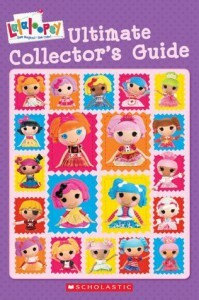 All the information on every single Lalaloopsy! Even on the mini Lalaloopsys and Lalaloopsy littles! Also included is a checklist and everything, it is so awesome! It even has information on Ivory Ice Crystals and Mango Tiki Wiki! And Tippy Tumblelina. I love Tippy Tumblelina! I was recently browsing on Amazon for something, and came across a DVD for Masterpiece Theaters Great Expectations. I was immediately giddy, and couldn't believe I hadn't already seen. What made me even more happy, was to discover that it was on Netflix. I cannot say enough wonderful things about this movie. It is so wonderful, filled with actors that fit the roles perfectly. It is a brilliant representation of Charles Dickens novel, and really felt like the story was coming alive before my eyes. For any of you that love Great Expectations, I would definitely give this version of the movie a try. And who can resist such a wonderfully creepy Miss Havisham? This book is a wonderful find. I quickly ran to my local A.C. Moore to get a new pair of precision-cut scissors (I still cannot find mine in my house), and peeked at their books. I saw this Barbie paper doll book was on clearance for $5. 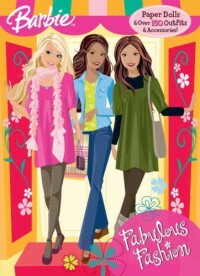 This book contains three paper dolls (Barbie, Theresa, and Nikki), and loads of clothes. The three girls on the cover are the three dolls in the book, though they do not look the same (their hair and poses are different). All three dolls have the same body shape and size, so the clothes can be used on any of the dolls. My two daughters and I each took one doll and split up all the clothes. We each ended up with nine pages filled with clothes! This book seemed endless. The pages are thicker card stock, and the dolls and all the clothes are punch out, so no scissors necessary. I prefer cutting out my paper dolls, but I will always say punch out paper dolls are so much better for children. I really don't have any complaints about this book, as it was such a good price with so many clothing pieces (shoes, purses, hats, and even pets included). Any little girl in love with Barbie will love this paper doll book. 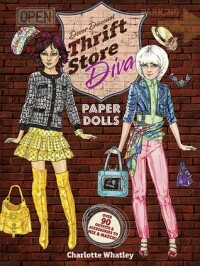 This paper doll book contains two diva dolls (Morgan and Sofia), which are present on the front cover. Both dolls are have the same body shape and size, so all the clothes provided within can be used for either doll. The clothing throughout the book show a thrift store price, along with where the piece was purchased (such as a garage sale, a charity thrift store, a discount department store). The dolls are printed on the inside flap of the covers of the book, so they are extra sturdy. The rest of the clothing is printed on pages that are thick enough for the clothing to hold up well. Tab placements are appropriate and useful. This book surprisingly has a ton of clothing for the two dolls provided, and would make a great gift for the little girls in your life that are interested in fashion and design. 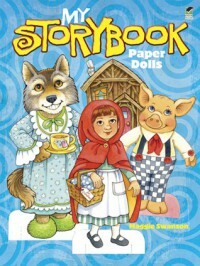 This is a cute paper doll book filled with characters from well known fairytales. This book includes Little Red Riding Hood, Goldilocks, the three bears, the big bad wolf, the three little pigs, and Puss in Boots. Each doll and all the clothing is printed on thick cardstock type paper, which is very sturdy. Each doll has different body types, so they cannot share clothing between them. The illustrations and style of these dolls are very adorable and would catch they eye of any young child. The colors are bright, and their is plenty of clothing for even the animal characters. This is a great paper doll book for any fairytale lover. After digging into this book, I decided to give a review on here. 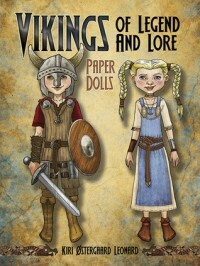 The book contains a paper doll based around Viking Legends, which includes a total of seven paper dolls (Thyra Danebood, Tove of Venden, Kraka the Shieldmaiden, Gorm the Sleepy, Harold Bluetooth, Ragnar "Hairy-breeks" Lothbrok, and the dragon, Lindwyrm). Each doll has a different pose, so their clothing can not be shared between them. Along with each paper doll, there is a short summary of the legend dealing with each person. I do wish that the book explained the legends a little more deeply, but I suppose I can't complain. The style of the paper dolls and clothes are beautifully done, and the colors chosen compliment the era of the Vikings well. The pages are all pretty thick, though not thick enough for the paper dolls to stand upright (even using the provided stands). The tabs for the clothing were placed very awkwardly. I was surprised to see parts of the clothing printed out onto the tabs, so that once folded behind the doll, it distorted the appearance of the clothes. Tabs were placed on a curved part of the body (such as the shoulder), so that you couldn't fold the tab over without really messing up the look of the clothing on the front. There was even a pair of pants where a tab was actually placed too far into the pants, so that folding the tab would over would still leave a large chunk of the bright white tab visible on the doll. I don't use tabs, and general snip them off, however, that specific tab even posed a problem for me, as I had to actually cut into the pants to remove the tab. Aside from the tabs, I really liked this paper doll book. I love how the characters from Viking legends are depicted more as children rather than adults. Their faces are so detailed and original on each doll, it really makes for a set of fun paper dolls. Especially if you are someone that has an interest in Vikings. I think that this paper doll book and a book that further explains these legends would be a great gift for a child interested in this culture. He put the papers into his briefcase, freshly signed by my hand. “The money will be deposited within twenty-four hours,” he explained in a cheery disposition, showing his whitened teeth as he smiled. I just nodded. Neighbors got word of my new fortune and began bringing me pies and cupcakes. I knew it was out of celebration, so I tossed them as soon as the door closed me up within my home, alone. My ears ached for her laughter as I held her framed photo in my shaking hands, feeling as though I was the one trapped beneath the earth. I will definitely be reading through my new Vikings paper doll book. I sort of love the idea of Vikings. I taught a history unit on Vikings for my youngest daughter this year, and it pulled me into the world of the Vikings. Ever since then I've been intrigued by their culture. I am also a lover of all things legend/fairytale/folktale type of stories. So I will enjoy reading through this book. I am also wanting to start The Joiner King today, however, Great Expectations has been much on my mind this week. I am uncertain where that will lead me in my reading today, so I listed both books! I have been wanting to read The Dark Nest trilogy for some time. I had it on an old e-reader that is not compatible with my Kindle, but only got to read a few chapters into the first book. So these three books have been on my mind since. I finally came across a good listing on Ebay, where I got all three books in the series (used) for a total of $9 (and free shipping). How can you beat that? I got them in the mail yesterday, so I am anxious to dig into the first book, The Joiner King. 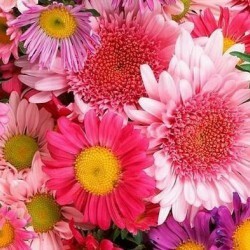 I have been so much enjoying the bouquets of flowers my hubby gave each of my my daughters for their dance recital last weekend. They are still surprisingly looking perfect, a week later. 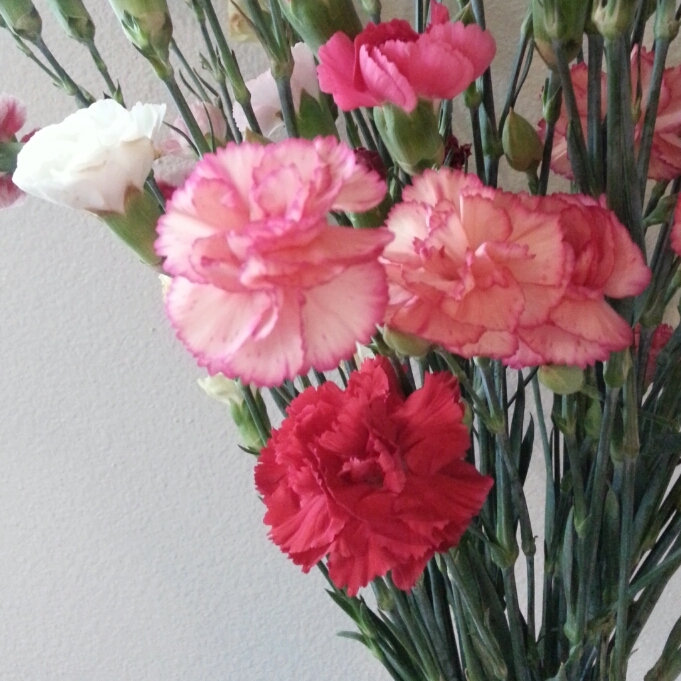 I am thinking I may have to turn these lovely recital gifts into a habit of keeping pretty flowers atop my bookshelf. It adds a lot of beauty and positivity into our living room. Our trip to the bookstore did reveal a couple of books I thought my hubby would enjoy for Fathers Day. There were lots there I thought he would enjoy, but missing the first book for the series (and he is very picky about reading books in order, any and all series). So, I settled on the first book in The Han Solo Trilogy: The Paradise Snare, and Tales of the Bounty Hunters. My girls also found a nice bookmark specific for a Dad, with a sweet little message on it. I hope he likes the books!